Having Problems Installing TFS 2012 Express on Windows 8? Update: I found a solution for getting TFS Express installed and wrote a short post, which may be helpful to folks having these problems on Win7, too. I tried to install TFS 2012 Express on my shiny new Win8 install, but found I couldn’t do it. As it turns out, that’s because you can’t do it. Not right now. TFS 2012 Express is blocked on Win8, until the SQL Server team ships an update, which I understand is coming sometime in October. Here is what happens: You try to install TFS Express and it complains about the version of SQL Server Express during the readiness checks (pictured). The error you get is TF400533, which requests that you upgrade SQL Server Express to the latest version by visiting Microsoft Update. But there are no updates for SQL Server Express on Microsoft Update. If you use the Control Panel in Win8 to check which version of SQL Server Express you have loaded, you’ll find you already have the latest version of SQL Server Express (pictured). So, you can’t do anything. But the request to visit Microsoft Update looks like a legitimate request. And it is. But you won’t find the update until later in October. 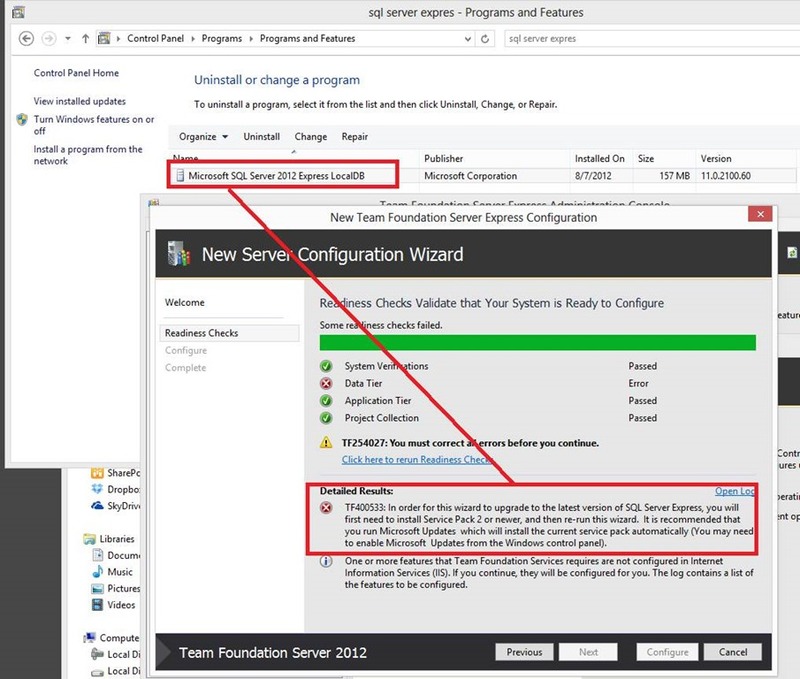 Categories: Tips | Tags: SQL Server 2012 Express, TFS 2012 Express, tfs installation, tips, Win8 | Permalink. I can’t install it for the same reason on Win7(64). Hi Matt! Sorry you’re having problems. I wrote a little more about this issue in a post today. I hope it helps. Let me know how you make out.